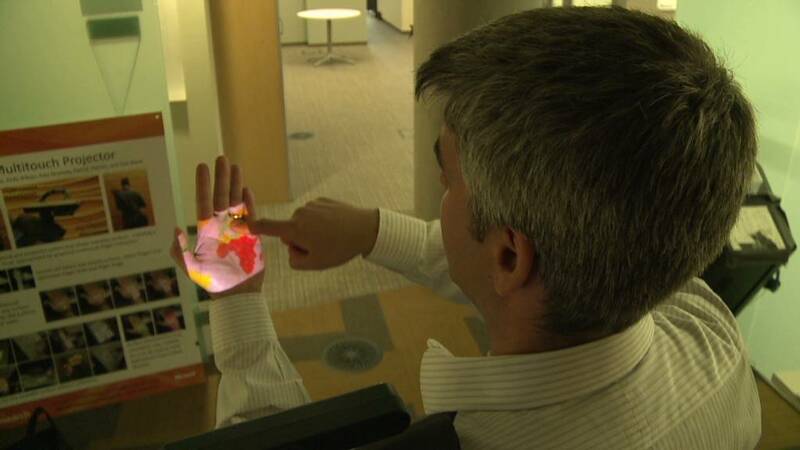 Microsoft has a vision for a world in which every surface is a Windows touchscreen. That became a whole lot closer to reality this week. A startup called Ubi Interactive is now selling $150 software that can turn any wall, desk or screen into a 45-inch touchscreen. Just hook up a Microsoft Kinect sensor and a screen or projector, and the display will instantly gain touch-screen capabilities. Ubi's software can even support touchscreens of up to 100 inches, at a cost of $379. Ubi worked with Microsoft (MSFT) engineers at the company's Redmond, Wash., headquarters last year as part of an exclusive "Kinect Accelerator" program. Ubi was one of 11 startups chosen to develop apps and software that work with the Kinect. The software-Kinect combo senses when a finger touches a surface, allowing the user to click, drag, drop, scroll, and perform all the expected functions of a touchscreen. The selling point of Ubi's technology is that touchscreens are useful but incredibly expensive -- particularly large ones used in meeting spaces or in-store displays. But many businesses have projectors or televisions already set up in conference rooms. Those could soon become touchscreens by combining a Kinect, which costs $250, and Ubi's software. "By making it possible to turn any surface into a touchscreen, we ... reduce the cost and extend the possibilities of enabling interactive displays in places where they were not previously feasible -- such as on walls in public spaces," said Anup Chathoth, Ubi's CEO. Having a large touchscreen handy will become increasingly important as businesses migrate to Windows 8, Microsoft's touch-based operating system. Microsoft is also developing a wearable projector technology that will allow smartphone users to project and control the screens of their mobile devices on to their hands.